Question: Where can I register? Answer: Click on the "Registration" button in the navigation bar above for ways and locations where you can register. Question: When are the deadlines? Answer: Click on the "Registration" button in the navigation bar above for deadline information. Question: Is there a day of race registration? Question: Is there a day of race packet pick-up? Answer: No. Sorry, there is no day of race packet pick-up. Click on the "Registration Information" button or the Expo/Packet Pick-Up button in the navigation bar above for more information. Question: When is packet pick-up and where? Answer: Click on the "Schedule" button in the navigation bar above for more information. Question: Is the course flat or hilly? Answer: The course is flat and fast. For more information, click on the "Course Information" in the navigation bar above. Question: How long do the courses stay open? Answer: All race courses are open until 2:00 pm. At that point, participants can be picked up, or they may finish on the sidewalks, at their own discretion. The Finish Line will stay up until the last runner/walker crosses. Question: Do you allow strollers? Answer: No. For your and other participants safety, strollers are not allowed. Question: Do you allow headphones? Answer: YES, they are allowed. Question: Can I change events once I have registered? Answer: Yes, but you will need to do this during Early Packet Pick Up (October 15-18), or on Saturday, October 19 at the Health Expo. There is a $15 transfer fee and the higher of the two entry fees will apply. There will be no refunds if you are changing to an event with a lower registration fee. Answer: Sorry, we do not provide refunds. Question: Can I transfer the registration into someone elses name? Answer: Sorry, we do not allow for you to transfer the registration into someone elses name. Question: Is there a clothing drop booth on race day? Answer: Yes, it will be located on Civic Plaza. Question: Are there portable toilets on the course and where? Answer: Yes. Please click on the "Course Info" button for more information. Question: What refreshment will be provided? Answer: On the course, there will be water and sports drink. At the end of the race there will be fruit and bagels. Question: Is there an official hotel for the event that offers discounts to participants? 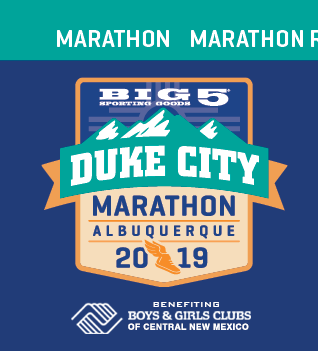 Answer: DoubleTree Hotel is the official hotel for the Duke City Marathon. You can book rooms by calling 1-505-247-3344 or online by going to doubletree.hilton.com. Answer: There are a number of parking opportunities including: Civic Plaza  Access off of Martin Luther King Jr. Blvd., Exit from I-25 cross 3rd street and it is on your immediate left (fee paid). Convention Center Parking - Access off of Martin Luther King Jr. Blvd. Exit from I-25, parking is just west of Broadway on the left hand side (fee paid).